Delicious and flavourful with every bite! 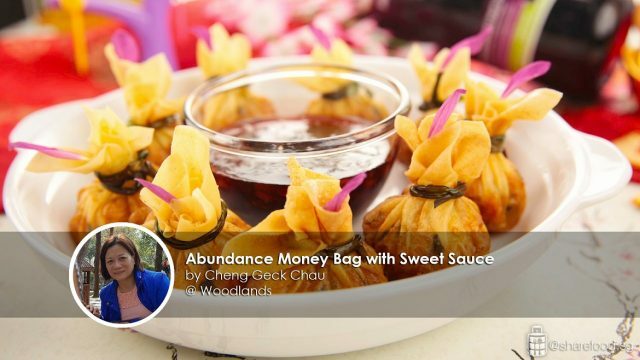 The Abundance Money Bag with Sweet Sauce is an auspicious Chinese dish that signifies a prosperous new with happiness and good fortune. 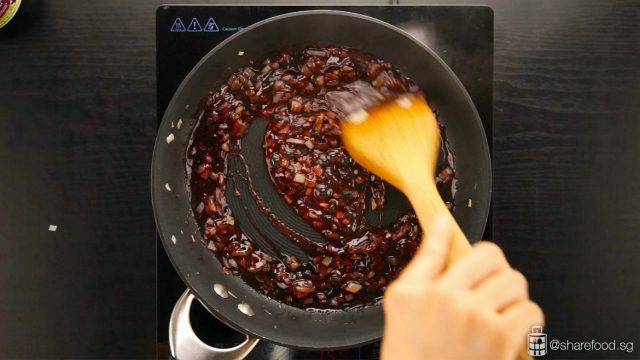 Stir frying the Ribena onion sweet sauce for the flavouring! Look at the money bag filling! 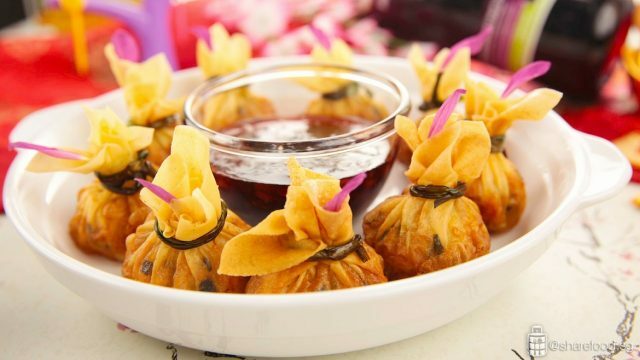 Not only is the money bag beautiful to the eyes, but each bite packed with multi savoury levels of flavour. 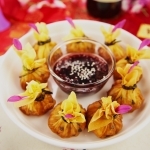 Packed with tender chicken thigh meat, fresh sweet prawn, crunchy chestnuts and wood fungus. A sensational experience that leaves your guests wanting more! Dip with Ribena onion sweet sauce to heighten the taste and binds all the flavour together. Feel free to change the chicken meat to pork. This is a cooking method that Share Food loves! 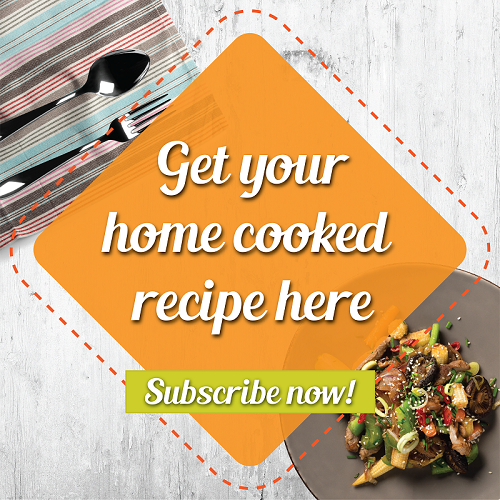 If you have any recipes that are cooked using this method, share it with us via https://www.sharefood.sg/submit-your-recipe/! Mix the minced chicken with the marinade. Set aside for 15 mins. Add the filling ingredients into the marinated meat and combine the ingredients. Cling wrap and place it in the chiller, allow it to marinate for 30 mins. Boil a pot of water. Blanched the chives for a few seconds. Remove from water and plunge them into a bowl of room temperature water. Set aside. Remove the meat from the chiller. Place 1 tsp of meat mixture in the centre of the wonton skin. 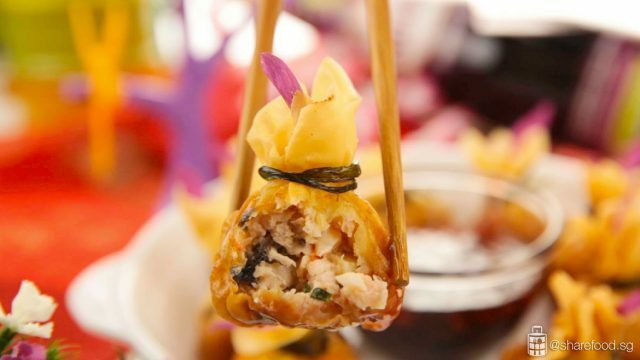 Gather the edges of the wonton skin together and pinch it with your fingers, squeeze gently to remove any trapped air bubbles. Use a chive to tie up the money bag. Tie a double knot to prevent the knot from releasing while frying. Heat up the oil in a deep wok over medium-high heat. Once the oil is hot, add in 3 – 4 money bags at a time. Ensure that they are standing upright to cook the filled portion first. Once the wanton skin starts to brown, flip the top of the money bag downwards to fry the top. Once it is fried evenly, place the money bag on a plate lined with kitchen towel. In a heated pan with 1 tsp oil, add in chopped onion. Stir fry till it’s slightly brown. Pour in Ribena cordial and corn flour, stir to combine until it thickens. Remove from flame and ready to serve.